i have my diary from the 9th grade too...funny stuff. Gah! Our younger selves are such entertaining strangers...but there is always a little something recognizable there, too. How true! 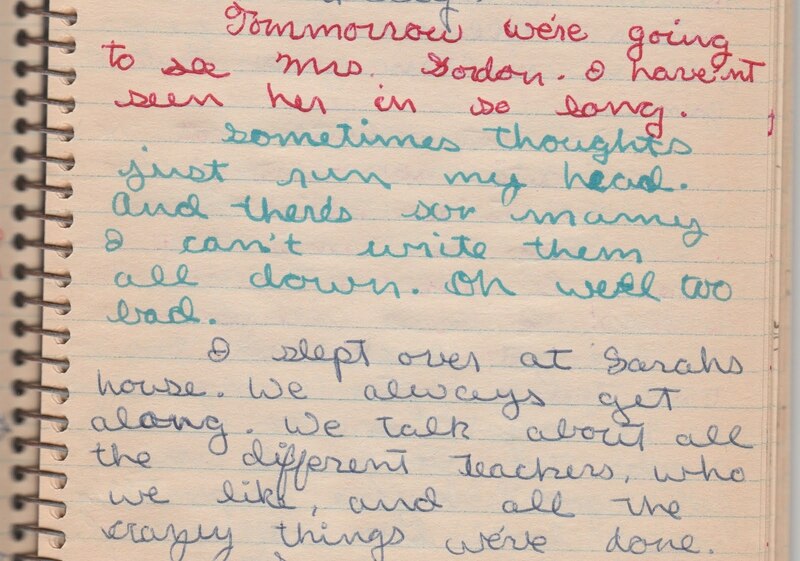 And how well I remember those days of changing ink and changing handwriting. I still love ink colors, actually. Then I threw them all away, which I regret. I ran across some of mine too. I wasn't crazy. I was just plain stupid. I hope they stay burnt. Also, your handwriting! Are you left-handed? I recently went through my old notebooks and cringed. I had to throw a few away, they were so bad. What a fun gem to find! I have a notebook I carry around trying to capture all those thoughts running in my head and I STILL can't write them all down. That's so funny about the handwriting--I remember working so hard to decide in which direction I would slant my writing. In the end, I went conventional. But Santa slants the opposite way. Funny how "the same" we stay. When we watch old videos, I hear the video echo me ... because I find myself saying the same things, laughing the same way, in the same places ... as I did back then. There's something gratifying and unnverving about those old diaries. A few years ago, I spent some hours leafing through mine--I was reminded of so much...yet I was also rather mortified...and ever so glad I'm not completely that girl any more. Well noted, though, that your blog is The New Kitty. And here I am, Miss Dissin. Honestly, I'm not sure why we collected and commented on your journals, but I think it means we cared. Love your blog. I had Mrs. Gordon too! Wasn't she great. i have kept my middle and high school journals, which my all means SHOULD be burnt to a crisp, in the hope that someday I will read them and have some sympathy for my daughter at that age. But maybe I should just burn them. The only old journal I have is written in French. Mon dieu! 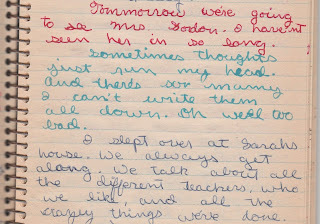 I kept handwritten journals from the time I was 11 until I was about 40. I still have some I write in, but not the way I did before. One summer I went back and re-read the early ones, and marveled at how much I had changed and how I had stayed the same. I love how you found that part of you, visible, peeking out between the childlike details, that one poignant phrase that helps you recognize your most original self.